Section Sizes and Size of Dreads. Dreadlocks Forums » Forum » General Talk » Page » Section Sizes and Size of Dreads. I have had my dreads for 1 week now, but the last couple of days (especially today) have been tough, I'm not happy at all with them and even had thoughts of cutting them off!! Well, It wasn't a very good for me. Background: I got them done by a person, who is supposed to be trained in making dreads, and paid to get them done. 1) SECTIONS: Apparently for unknown reasons she divided the head into a uniform grid rather than a bricklayer kind of thing and the result is there is a lot of white spots where the scalp can be seen. Will this problem be minimised in the future once the locks get fatter? 2) SIZE: I think the sections are too big. I haven't measured them, but I think they are 1 1/2 inch and the dreads are too thin at the moment. With sections this large, I expected the dreads to be fatter from the beginning. I have 33 dreads now, but thought would have a few more as I seemed to have a lot of hair. Will the dreads thicken up to roughly the size of the sections? If so, how would they thicken if the hair is already trapped into the dread? When you look at my head, there are a lot more sections than dreads, you know?! I was expecting that the dreads would cover a lot more area, rather than having all these sections and scalp visible. Is this normal at the beginning??? 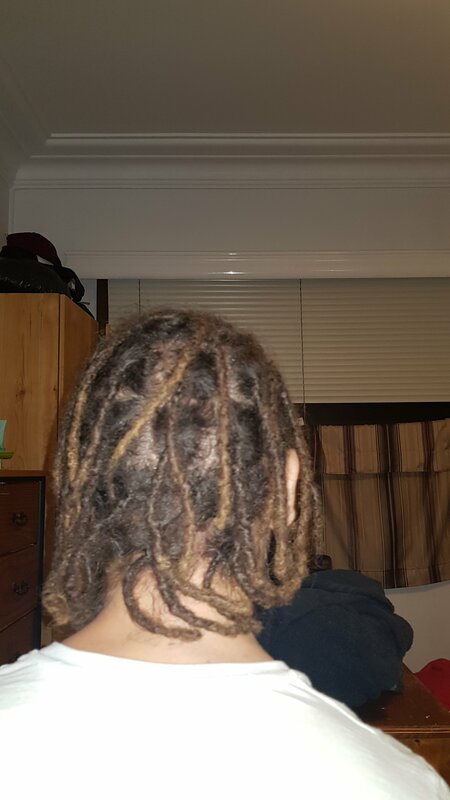 I have been wanting dreads for AGES really, maybe 20 years and now I'm feeling so bummed and sad that I'm not even enjoying them anymore. It is a disaster!! You're not going to like this but you have wasted your money. The sections are way too big and it looks like the dreads were done with a crochet hook so they are way too tight (hence how thin they are) and by using the crochet hook a lot of your hairs will have been broken and each dread will actually be full of tiny hairs that have been broken off. Best to wait for Soaring to next come online and he will give you some links to problems with crocheted dreads and what you can do about it but take it from someone that went through the same thing. I ended up combing them all out and was so much happier. I would definitely think about combing yours out. Yes, I do feel like my money was wasted. I took me 3+ years for the hair to get that long, so I'm devastated. I feel mutilated!!! I don't know about combing them out because they were crocheted, so I think it will be very very hard to comb them out and on top of that not cause more hair damage. They seem pretty tight and I'm not very confident in doing that. Now I'm looking for the best course of action to save the dreads and have them looking nice. Like I say I went through the same thing except my sections were nowhere near as big. You could just leave them alone and as the new hair grows at the roots it will dread by itself but you will always have those thin hard bits at the end unless you cut them off when the hair gets long enough but even then you will have natural dreads but they will be massive because of how big the sections are. What I'd recommend is to condition them every couple of days for 3-4 weeks then comb them out with a flea comb. In all it took about 2 weeks to comb them out doing a couple every day. The only problem is my hair thinned out a bit but it's because of all the hairs the crochet hook had broken which were actually no longer attached to anything but were only held in place because the dreads were so tight. Check out the first post of my original timeline thread so you can see the progress from combing them out. Then after 5 months of neglect I used the sectons that had naturally started to form to Twist and Rip and started a new timeline. Now 6 months after combing them out I am much more happy with my hair now than I had been in a long time. If you decide to not comb yours out for whatever reason then I urge you to come back here in 6 months time and see what could have been while you are still dealing with stiff dreads and massive sections. I know 6 months seems like a long time off but I am so glad that I did what I did. Honestly I wish I had someone that had been through it giving me the information I'm giving you back then. 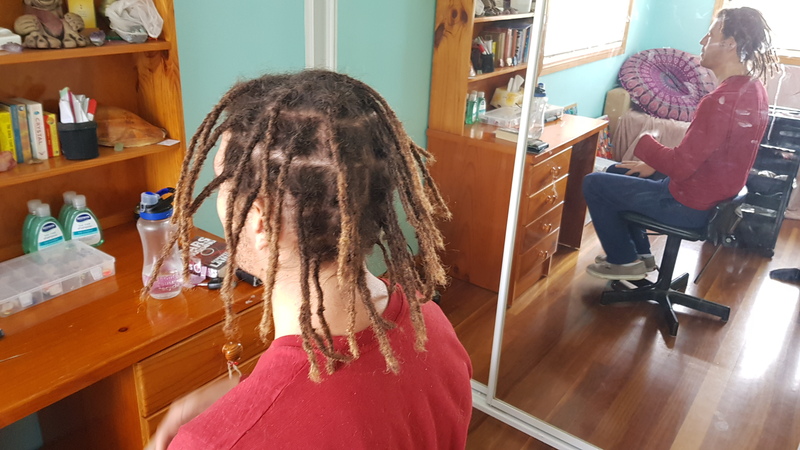 Also, thanks to Bazooka because seeing her pics on her timeline made me realise how good Twist and Rip dreads can look and is what convinced me to do it after 5 months. Thanks for the sharing your timeline and what you went through. I'm just not sure what to do. Maybe just let them grow and then re-section those fat dreads once they are big enough. I'm more inclined on NOT combining them out and then down the road split them if needed. From what I was told, my hair is thin and a big section was needed to get the dreads the size they are now, which is close to "pencil" size, and to ensure they will be thicker (maybe like "sharpie" size) down the road. One thing I don't get is, how do the dreads become thicker over their body if the hair is already dreaded? I see how this could happen at the root and size of the section, but does the overall dread get thicker as well? @soaring-eagle, Maybe you could shed some light on these question. The reason they are so thin is because the crochet hook pulls the hair in so tightly together. It shouldn't be like that. As for the thickness as the hair dreads it doesn't go straight out from your scalp as it does now it will wrap around itself and back on itself and in every direction you can think of, that's what makes them thicker. The standard thing seems to be that they will be as thick as the sections are at the roots. In your case you will end up with some massive heavy dreads. As for not wanting to comb them that's really up to you. I'm just giving you all the information I can and making recommendations but you shouldn't feel obligated ot follow them if you don't want to. When you say split the dreads I'm n ot really sure what you mean. Do you mean using a pair of scissors and cutting down the middle from tip to scalp? That won't work for a couple of reasons. Firstly because of what I said before about how the hair wraps around in all different directions by cutting down the length of the dread you will actually be cutting off of the length of the individual hairs which may then fall out and rather than being left with 2 dreads you will be left with 2 halves of one dread that will be very thin and frizzy. your hair is thin? you know thats a damn lie look at your hair thats incredibly thick..and absolutely perfect for natural dreads! I mean how did you prevent it from dreading all these years you must have combed it more then once a day. Your comments have been very important. Before I got the dreads, I used a lot of conditioner to prevent my hair from completely dreading all over the place but in the back of my head there were some dreads already. 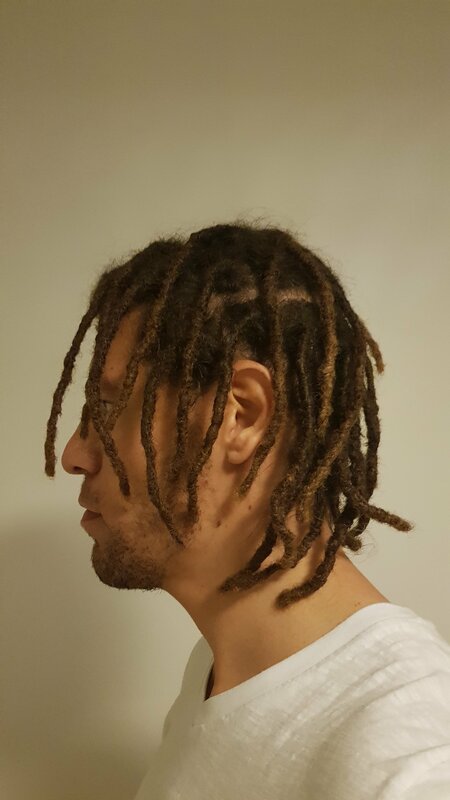 A couple of weeks before getting the dreads, I stopped using conditioner and my hair was matting like crazy and all over the place with no defined dreads, except at the very back. After giving a lot of thought and further consideration, I'm coming to the point where I might comb them out and accept that I'll lose some length and that the hair will be much thinner. But, there is another part of me that kind wants to wait and see how big the dreads will get and that they might be fine. BUT, whenever I look at the sections I realize that they might end up being TOO thick, so I would be best to fix it now rather than later. 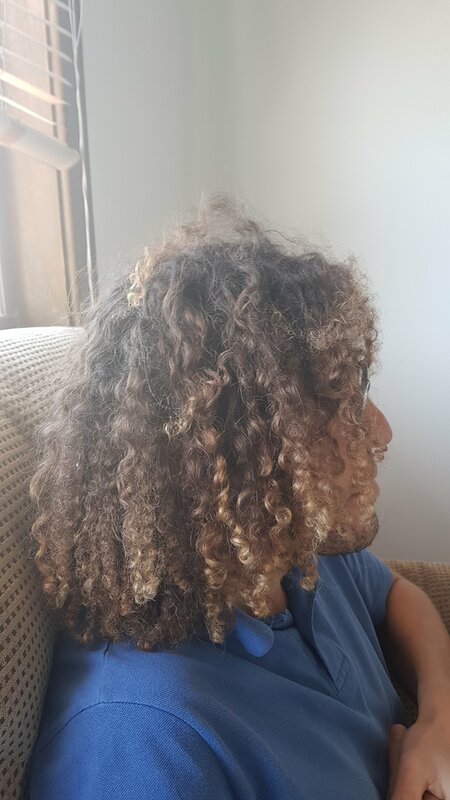 How long should I wait before Re-dreading the hair after it is combed out?